"; $(w.document.body).html(before + html + "
When shipping a fragile item, it is necessary to protect it well, so that it is not crushed, or broken by being knocked about during transport. 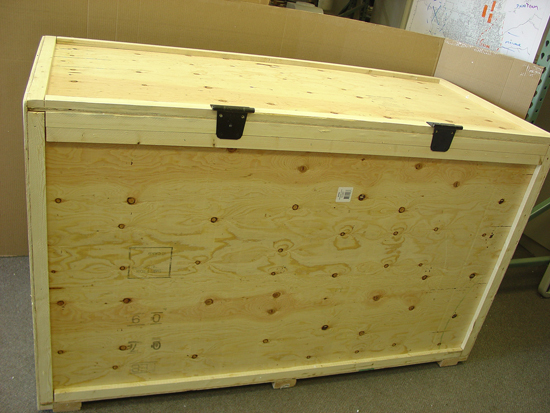 A well-padded wooden crate that is custom-made to fit the size of the item being shipped is often the best solution. 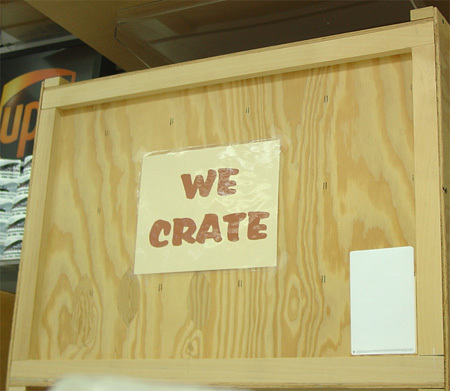 Here are step-by-step instructions on how to build such a crate. 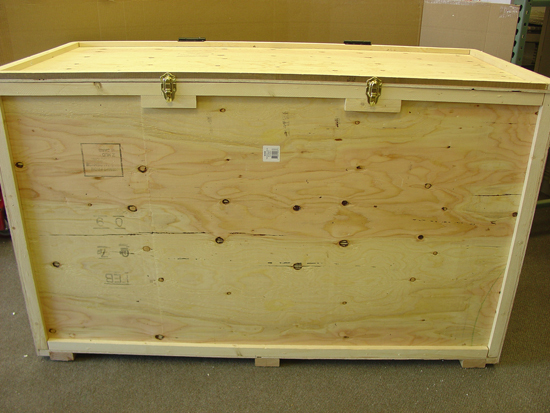 The size of the crate depends on the size of the item to be shipped and the padding necessary to keep it safe. 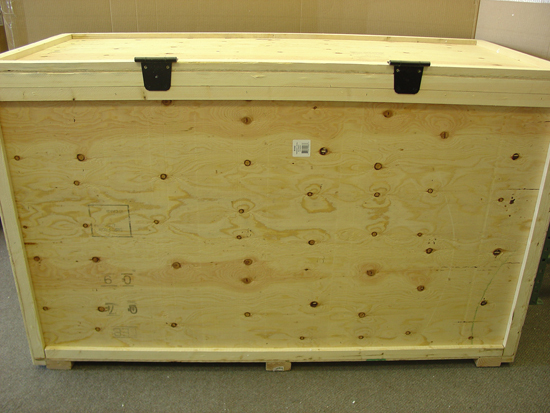 So, the first step is to enter the length, width and height of the item. 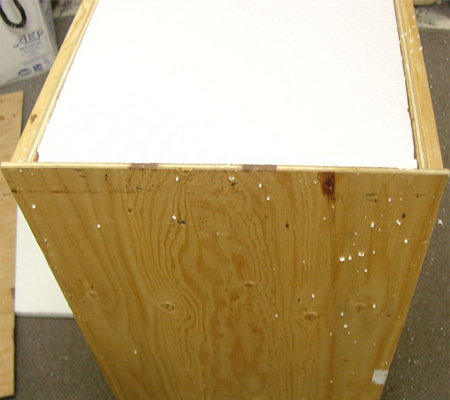 Next, you will determine the dimensions of the styrofoam sheets (or other padding). 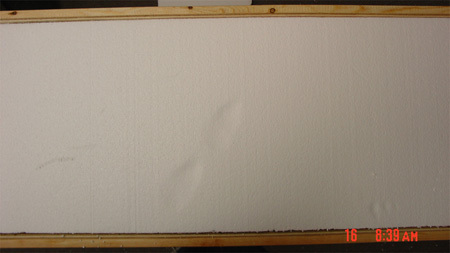 Then you must provide the size of the furring strips (1x2, 2x4, etc.). 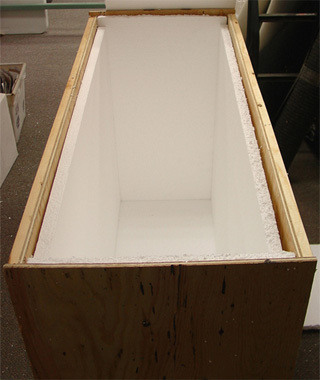 With this information, the size of the plywood sheets to enclose it all is calculated. 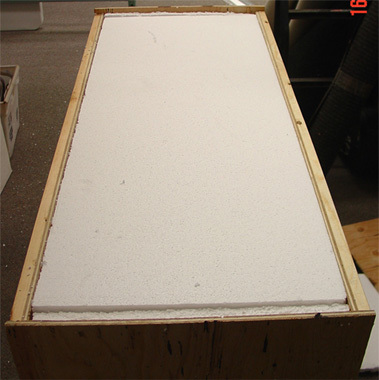 The tool below will calculate for you the number and sizes of padding and plywood pieces to cut, as well as the length of furring strips needed. Click the button at the bottom for instructions on assembly. Use the longest side for the length, the shortest for the width and the remaining side for the height, unless it must be right-side-up. Then, use the natural height for the height (footprint: longest=length, shortest=width). 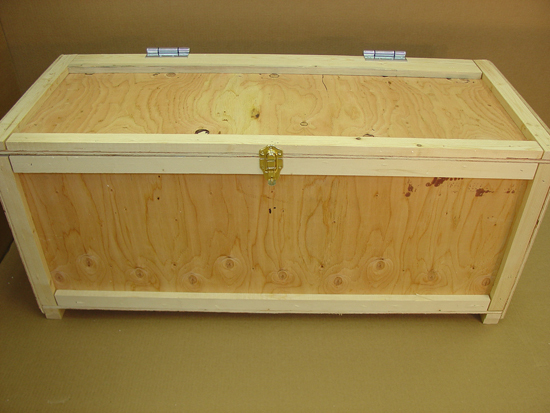 Length 1/8 1/4 3/8 1/2 5/8 3/4 7/8 "
Width 1/8 1/4 3/8 1/2 5/8 3/4 7/8 "
Height 1/8 1/4 3/8 1/2 5/8 3/4 7/8 "
The item being crated is already packaged and padded. It does not need any more. 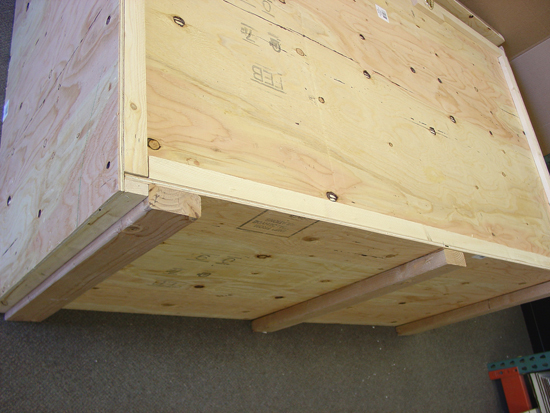 This method of building a crate in not suitable for an item with the dimensions you have entered. 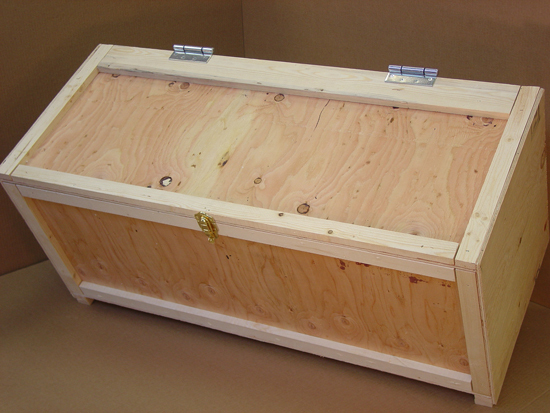 You will need to use a 2x4 frame method of building a crate, which is not supported by this tool. 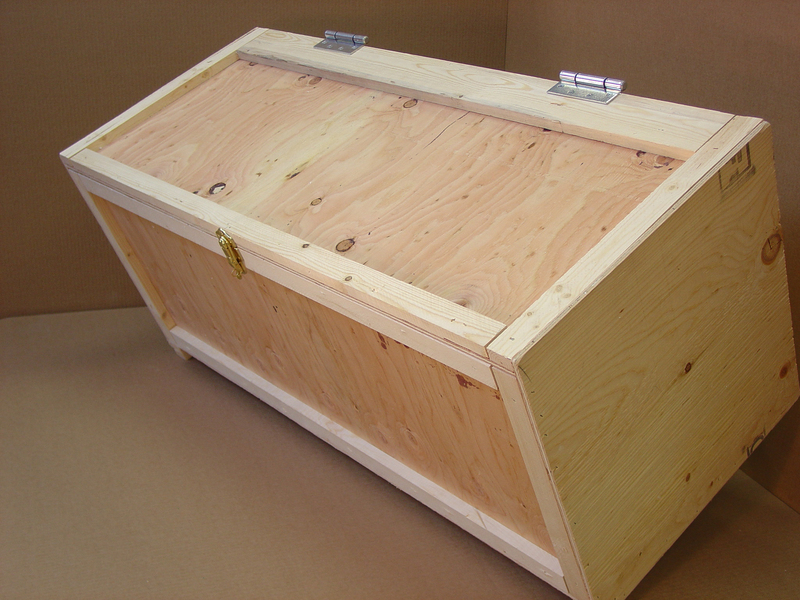 Cushioning is usually needed to protect the item you are shipping. 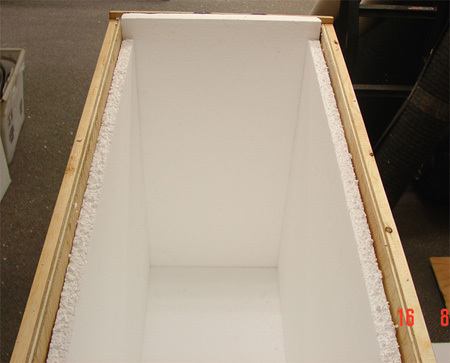 Usually styrofoam or soft foam sheets are used, but you can use rolled foam, bubble, blankets, wrapping paper, etc. Please enter how much padding you need and the thickness of the sheets that you are using. Thickness of sheets? 1 1/2 " 2 "
1/8 1/4 3/8 1/2 5/8 3/4 7/8 "
How much cushioning is needed? 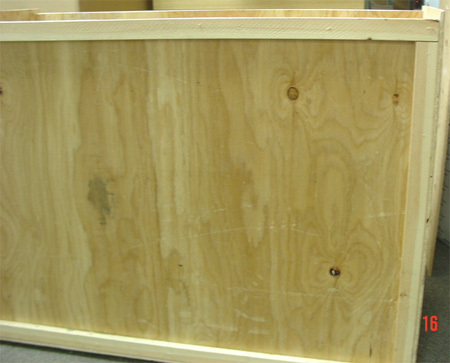 With the thickness of the plywood and the thickness & width of the furring strips, we compute how many pieces of plywood (and size of each) and the lengths of the furring strips that you need to cut. Selecting a 1x2 or a 2x4 for the furring strips figures in the shrinkage, but for other sizes, please enter the actual thickness & width. Note: At least two 2x4 bottom skids are needed, if a forklift is to be used. See Instructions page or slide show (above). 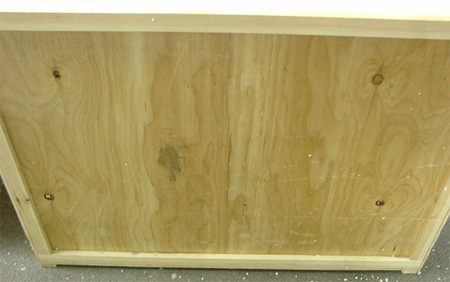 Thickness of plywood? Attach 4 furring strips to each side piece using staples or screws. Attach 2 furring strips to top piece and 2 furring strips to bottom piece. 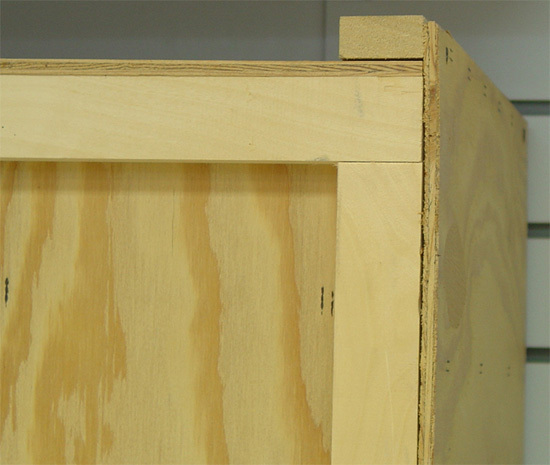 Attach the side plywood pieces to the bottom plywood. Attach end pieces with the longest side of end piece vertical. 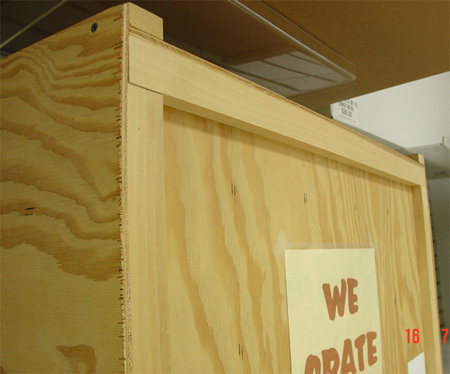 Raise end piece 1/8" (thickness of cardboard) off ground when stapled to side piece. 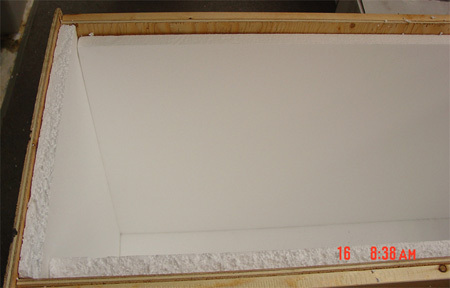 Insert end pieces of styrofoam into each side. 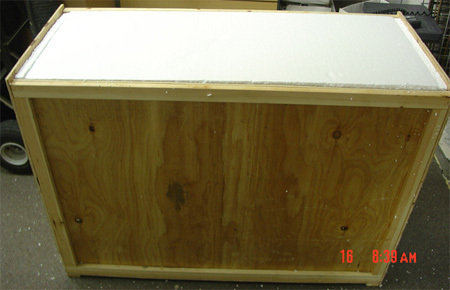 Insert bottom styrofoam sheet, pushing to the bottom of the crate. Insert the item to be shipped. 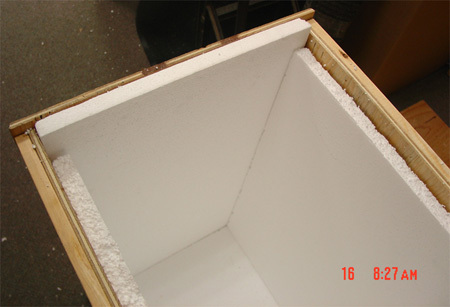 Insert top stryrofoam into place. 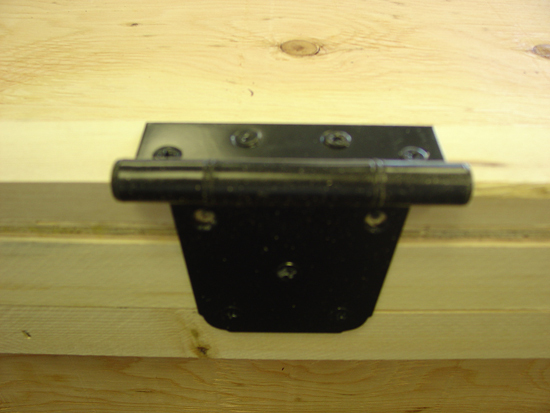 Attach top piece of plywood using only screws (NOT STAPLES) so the top can be removed by recipient. 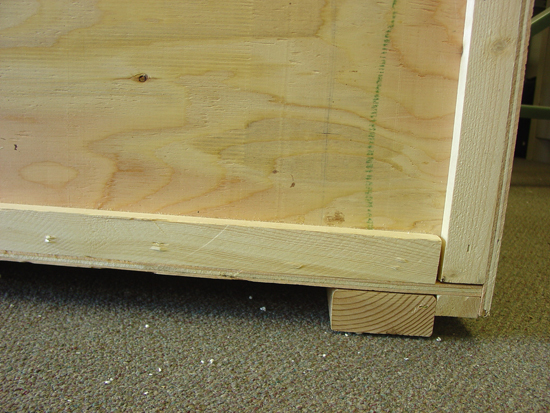 If your crate is to be picked up by forklift, attach two 2x4 skids in addition to existing bottom furring strips using 1.5" staples or screws. 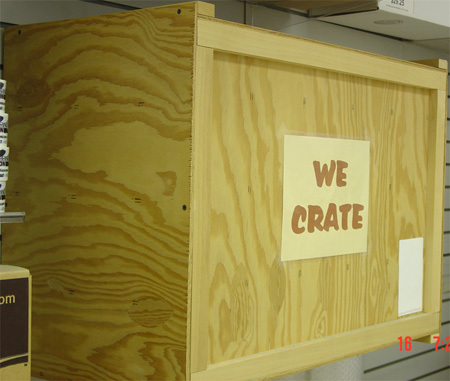 This allows the forklift room to fit under the crate. 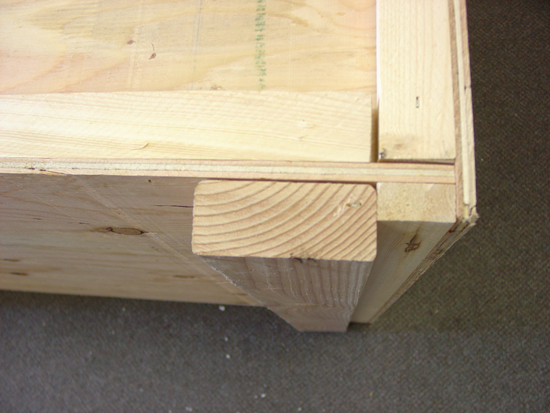 If your crate is longer than 48", add three 2 X 4's to the bottom (see pictures) These are the same length as your existing bottom furring strips. Our pricing is $95/hour* for 2 professional movers, a full-sized moving truck, moving blankets, dollies, tools, & stretch wrap. Our pricing is $80/hour* for 2 professional movers and dollies. 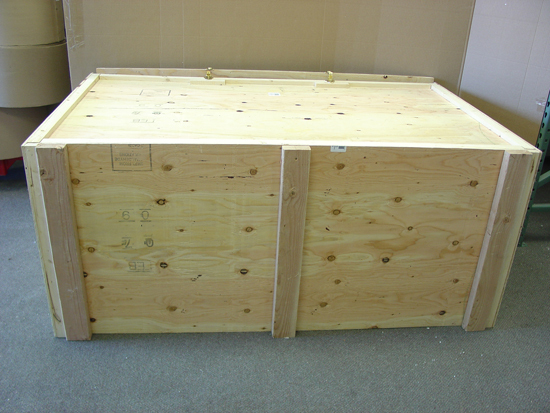 Inter-state moving is regulated by the U.S. Department of Transportation. 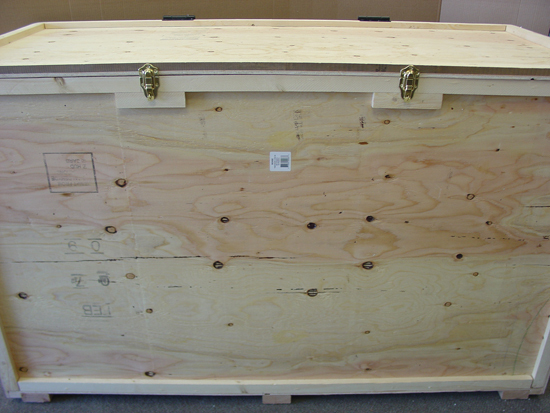 As a licensed mover, we will inspect the items you would like to have moved before making a binding offer. Online estimates for moves are not valid for interstate moves. Call (801) 532-6683 or toll free (888) 580-7447 to make an appointment for the estimate. If you are moving out of state, but are renting your own truck (like a U-Haul truck), we can assist you in packing it, so that the load will not shift during the trip. If you are moving to the Wasatch Front, we can help you unload your rental truck, assemble furniture and hook up appliances for just $80/hour for 2 professional movers and dollies. 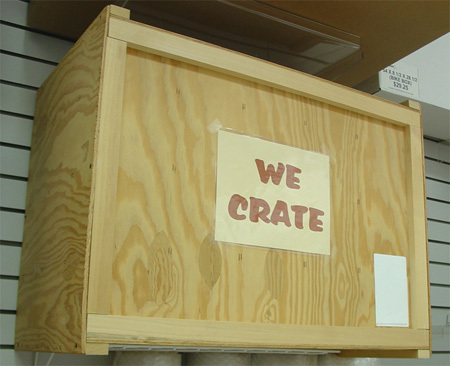 Individual moving supplies, moving supplies in convenient, pre-arranged kits, and moving equipment. Take a look at the possibilities. © Copyright 2012, Moving-Connection. All Rights Reserved.